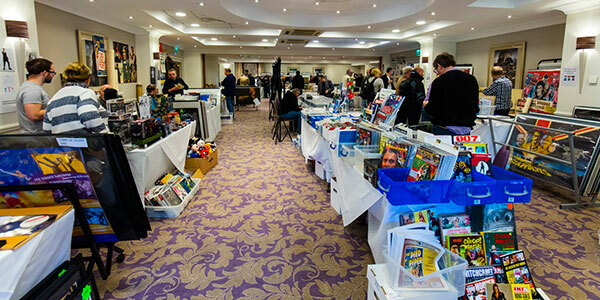 Stephanie and I spent a very nice Sunday at the 2nd Oakley Court Film and Memorabilia Fair on the 24th February 2019. It was strange to be back at Oakley and in the Windsor Suite without seeing everyone dressed in Rocky attire, but nevertheless with the sun shining and unusually warm weather for February we had a very enjoyable afternoon. 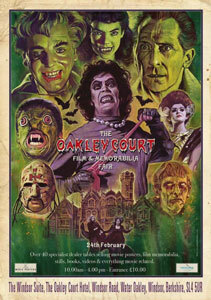 One of the highlights was meeting the creator of the amazing poster that was produced for the event, Graham Humphreys. Graham is an incredible artist and very friendly as well. He had designed this wonderful poster paying homage to the movies that were shot at Oakley Court when it was often used as a filming location by the adjacent Bray Studios. The event was selling A2 copies of the posters on the day and attendees could also pre-order the poster with their ticket to the fair. Graham individually signed and numbered each poster as they were bought/collected. You can see more of his amazing work at www.grahamhumphreys.com/. We met Jake Roche author of The Oakley Court Book who was running a stall for his book sales. So nice to see him once again. There was a good selection of items available at the fair, not a huge amount of Rocky items, although there were a few original quad posters there (hundreds of pounds each!). Stephanie and I bought a few things, find of the day was a catalogue for a movie poster sale at one of the big auction houses, with a 'Doctor X' poster as the cover. Steph also got herself a very interesting book from Phil Campbell and Brian Reynolds, who were involved with the Hammer House of Horror movies. As well as the merchandise tables the fair also had actress Caroline Munro, star of many horror movies and The Spy Who Loved Me bond movie doing autograph signings and chatting with attendees. Lovely lady and very friendly to all the attendees. After the fair Steph and I went for a wander round the grounds (how can you not?) and met a few people taking photos to recreate scenes from various movies filmed at the Court. So it's not just us Rocky fans that do this. Well worth the visit, we look forward to the next fair. Photos from the day. Click on a thumbnail image below to see a larger version.